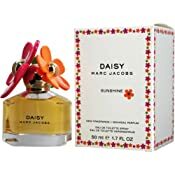 Marc Jacobs Daisy Sunshine Perfume for Women 1.7 oz Eau De Toilette Spray Radiant. Colorful. Beaming with sunshine. Marc Jacobs Daisy Sunshine Editions capture the essence of summer with a carefree spirit and joyous playfulness. With a splash of sunshine everything feels uplifting. Notes: Red Currant, Guava, Juicy Mandarin, Lily of the Valley, Violet, Lychee, Apricot Skin, Blonde Woods, Musks. Style: Vibrant. Floral. Fruity. Item Condition: Packaging for this item may be different than retail packaging. 100% authentic, new item. Daisy Sunshine by Marc Jacobs for Women 1.7 oz Eau de Toilette Spray.